A visitor throws a ball at a basket attached to a portrait of Soviet-era dissident Alexander Solzhenitsyn, at the Museum of Modern Art in the centre of Russia's Siberian city of Krasnoyarsk June 13, 2011. 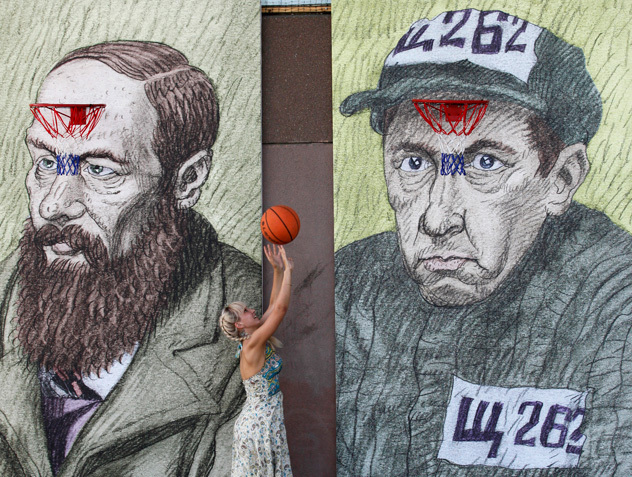 The "Blue Noses" art group, financially supported by the fund of Russian billionaire Mikhail Prokhorov, presented the "Siberia Ball" installation, which includes 12 grotesque portraits of well-known people, who influenced the history and culture of Siberia, with basketball baskets attached to them. The portrait of writer Fyodor Dostoyevsky is at left.